Sign up with your email address to receive weekly announcements from St.Faith's. St. Faith is invited to Christ Church, 12116 – 102 Avenue. Over a month at St.Faith's you will experience different expressions of worship. Two of our Sundays present an Anglican liturgy from the Book of Alternative Services (BAS). One Sunday is an Aboriginal expression of an Anglican liturgy, called Standing Stones. Bleeding Heart Services view the liturgy through an arts lens. On months with a fifth Sunday, we hold a Taizè-style service. A shared lunch follows every Sunday service. Experience a monthly church service with space for creative experession and reflection. Rooted in the rich language and tradition of Anglican liturgy, each Bleeding Heart Liturgy seeks to explore new artistic paths and invite new voices into the gathering. There will be no Bleeding Heart Service for the months of April and May 2018. Second and Fourth Sundays at St. Faith's feature liturgy from the Book of Alternative Services. These gatherings join in with practices of Anglicans and other traditions all over the world, featuring Scripture readings from the Revised Common Lectionary. A B.A.S. Service is participatory, with 'call and response' readings from the congregation, and many opportunities for parishioners to get involved in readings, prayers and other parts of the liturgy. Bulletins will guide visitors and parishioners through each service as it unfolds. As St.Faith's Anglican Church occupies traditional Treaty 6 land, we continue to walk in reconciliation between Indigenous and non-Indigenous people. Many Indigenous people call St.Faith's their church home. With the help of elders, our Standing Stones Services blend traditional Indigenous spiritual practices with traditional Anglican liturgies. No prior knowledge of Indigenous spirituality is necessary, as all are invited to explore this new 'hybrid' expression together. This process is an invitation to learn together. Each service begins with a 'smudge' and includes special stories, prayers and songs. Same as 'SECOND SUNDAY', above. Taizè is a monastic community in France, and their beautiful contemplative worship practices have been incorporated in churches around the world, both Protestant and Catholic. At St.Faith's Taizè, expect a service similar to our B.A.S. Service, with more contemplative music that repeats a simple form, similar to a chant. These gatherings are hospitable and simple, making them an easy entry point for newcomers and visitors. 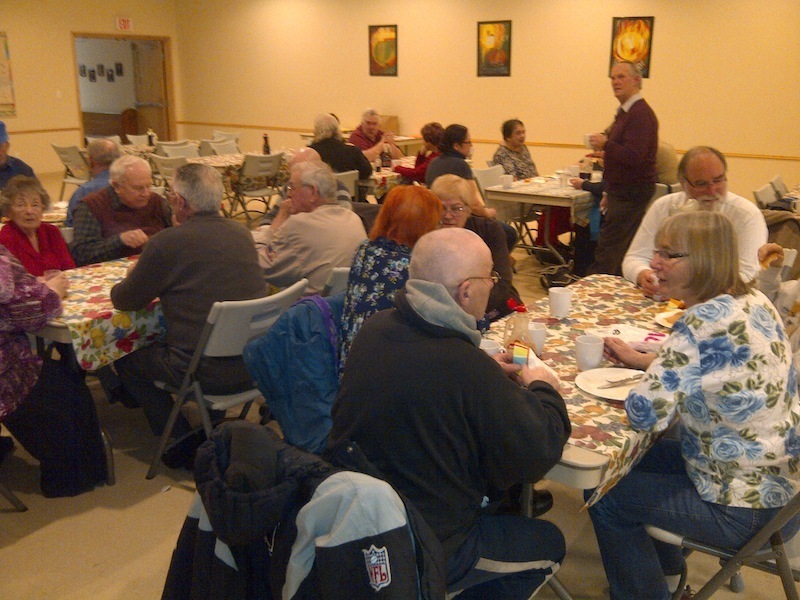 PrayerWorks community meals run from mid-September through mid-May. These meals are offered free to any who wish to attend, and provide healthy food and good conversation for our Alberta Avenue neighbours. Volunteers are always welcome to help prepare and serve. Phone the church or email info@stfaithsanglican.org to volunteer. Saturdays from 8:30 to 9:30 AM. Hot and cold breakfasts are served on alternate weeks. As St.Faith's Anglican Church occupies traditional Treaty 6 land, we continue to walk in reconciliation between Indigenous and non-Indigenous people. As an Anglican Church, we acknowledge our past complicity in colonial practices, and the abuses of the Residential School System. Our path forward is one of repentance and reconciliation. With the help of elders, our Standing Stones Services blend traditional Indigenous spiritual practices with traditional Anglican liturgies. Each service begins with a 'smudge' and includes special stories, prayers and songs. Our community is involved in many other initiatives around 'truth and reconciliation' through the year. Bleeding Heart is a space for art, faith, hope and love, and a part of St.Faith's. Our community is behind this exciting community initiative to weaver art and faith into a tapestry of transformation. Bleeding Heart also produces the Bleeding Heart Service, a monthly arts-infused liturgy that is part of our regular rotation of services. You can learn more at the Space's website at BleedingHeartArt.Space.